It’s difficult, after four years of drought, to think in terms of rain. Making preparations for a wet winter may offend the superstitious, or seem contrary to the priorities of recent years, but Daniel Swain’s blog offers a most comprehensive forecast for the coming months. 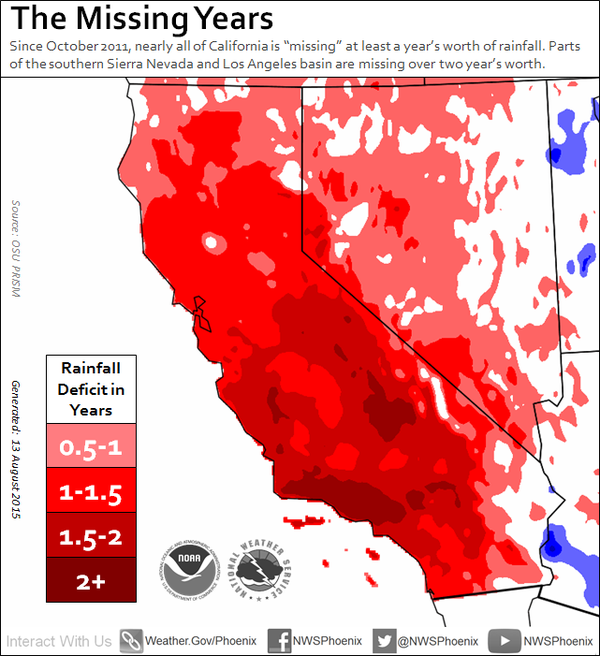 Should California be the target of a “Record-strength El Niño,” its impact on the West may be exacerbated by current and recent wildfires. This entry was posted in Ranch Journal and tagged El Niño, weather, wildfires. Bookmark the permalink. Thanks for sharing Daniel Swain’s blog. Very informative! Science can track the three Pacific hurricanes (Kilo, Ignacio and Jimena), but there’s no real way to express how these systems effect the moods of the island inhabitants. Their influence on the climate and environment has an inevitable impact on the humans/animals living in it. Living out here in Hawaii, with these three cyclones churning out at sea, it’s been interesting to experience weather’s influence. I’m sure you see a version of this in the drought and heat of CA. With modern technology, we may be more informed than the early native peoples, but what do we do with the information? You can’t stop a hurricane or a landslide. You can only prepare as much as you are able. I’m interested to hear what Dry Crik is doing with the what the weathermen are predicting. We’re trying to get our ‘house’ in order in the eventuality of heavy rain. Beyond cleaning the house gutters, getting gravel down in the driveway, perhaps road maintenance is my main priority. We’ve been unable to do much these last 4 years because it’s been too dry to work the miles of roads, the lifeline to our cattle. Getting storm runoff off these dirt tracks is essential. I’m hoping we’ll get enough moisture early to address the roads before it really rains. The dead oaks due to drought are falling regularly, more will fall if it storms, limiting our access to cattle as well. Dry Creek hasn’t been scoured of deadfall since 1998. The build up due to drought may divert the creek in places. Generators and our equipment need to be serviced, all that kind of stuff that becomes more of a priority. Our mindset has been drought, we just have to start thinking (and remembering) storms and address what we’ve ignored for the past decade or so. A feast or famine situation can be very difficult on either side. I hope when the rains do come that they come in a way that is manageable as well as welcome.